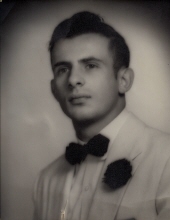 Ronald Renna, age 84, a resident of Oak Forest, IL, passed away on October 24, 2018 in Plainfield, IL. He was born on October 27, 1933 in Chicago, IL. Ronald is survived by his loving wife, Patsie, whom he was together with for over 65 years; his son, Nick Renna; his grandchildren, Zachary, Neal and Sara Renna; and sister, Rosemarie Wotez. He was preceded in death by his parents, Nicholas and Adeline Renna. Ronald was a proud veteran of the US Airforce. An interment service with military honors will be Monday, November 12, at 11:30 am at Abraham Lincoln National Cemetery, Elwood, IL. Overman-Jones Funeral Home & Cremation Services is entrusted with arrangements. To send flowers or a remembrance gift to the family of Ronald Renna, please visit our Tribute Store. "Email Address" would like to share the life celebration of Ronald Renna. Click on the "link" to go to share a favorite memory or leave a condolence message for the family.